According to foreclosure-tracking firm RealtyTrac, the number of foreclosure filings nationwide dropped for the second straight month in December. After falling 21 percent in November, filings were down by an additional 2 percent in December. “Foreclosure filing” is a catch-all term, comprising default notices, scheduled auctions, and bank repossessions. 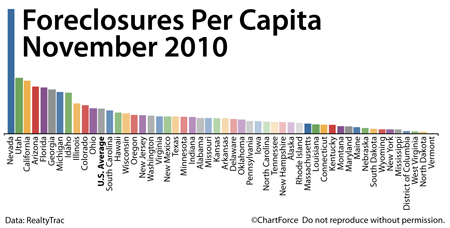 Like most months, a small number of states dominated December’s national foreclosure figures. 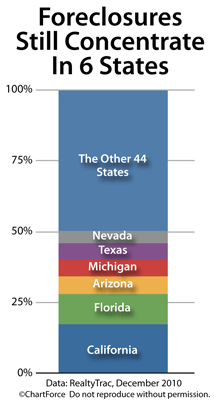 6 states accounted for more than 50 percent of all bank repossessions. December’s foreclosure filings fell to its lowest levels since June 2008, but we can’t read into the report too much just yet. 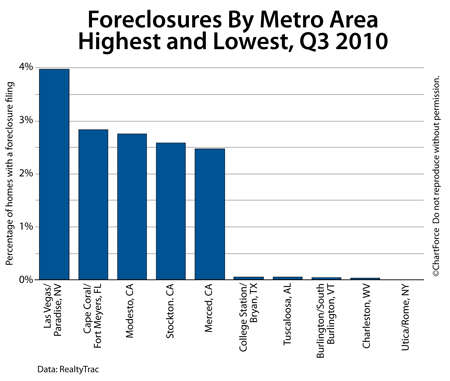 Foreclosure volume continue to be dampened by lawsuits and moratoriums related to controversy surrounding the so-called robo-signers. Foreclosure activity may have lessened in December anyway, but we can’t know for certain. Distressed properties are in high demand among home buyers, accounting for one-third of all home sales; typically sold at a steep, 15 percent discount as compared to non-distressed properties. Buying foreclosures can be a terrific “deal”, whether for the end homeowner, or an investor planning to rehab and resell. For today’s home buyers, though, foreclosures represent an interesting opportunity. Your best real estate “deal”, therefore, may be that non-distressed home that’s in sound, move-in ready condition if you are a retail homebuyer. But as investors, distressed homes are our greatest opportunity. The number of foreclosure filings rose 3 percent in September, according to foreclosure-tracking firm RealtyTrac. The term “foreclosure filing” is a catch-all word for housing, comprising default notices, scheduled auctions, and bank repossessions. September marked the 19th straight month that the number of filings topped 300,000, and the first month in which 100,000 repossessions were logged. 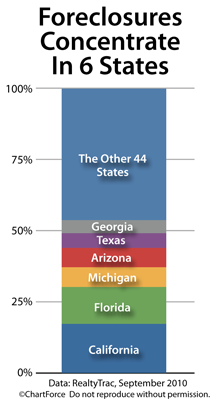 As usual, a small number of states dominated the national foreclosure figures, accounting for more than half of all repossessions. Thankfully for home sellers, mortgage servicers appear to be metering the pace at these newly bank-owned homes are made available to the public. RealtyTrac notes that, in doing so, servicers prevent “the further erosion of home prices”. That said, distressed properties still sell at a steep discount. In the second quarter of 2010, the average sale price of homes in the foreclosure process was 26 percent lower than the average sale price of homes not in the foreclosure process. It’s no surprise, therefore, that, based on RealtyTrac’s preliminary data, 31 percent of all homes sold in September were “distressed”. There’s lot of good deals out there, in other words, but they come with certain risks. Real estate investors are sometimes buying to fix up and resell, and the pace of foreclosures is driving down the sales price of retail purchases also. In MA and NH, even when you price a finished home below the comps in the area, you can still take a steep discount when it comes to finding a buyer. They are picky, and they have a lot to choose from. So be sure you take all your costs into account when making your offers. According to foreclosure-tracking firm RealtyTrac, the number of foreclosure filings climbed 4 percent in August from the month prior. A foreclosure filing is defined as default notice, scheduled auction, or bank repossession. Despite the number of filings surpassing 300,000 for the 18th straight month, RealtyTrac’s report shows some bright spots for housing. In addition, each of the 10 leading metro areas for foreclosures posted year-over-year declines for the second month in a row. But, perhaps, most important, is that mortgage lenders and servicers appear to be managing their REO more effectively, making properties available for sale at a measured pace as opposed to flooding markets with new homes. As noted by RealtyTrac, the probable reason is “to prevent further erosion of home prices”. For home sellers, it’s a welcome development. 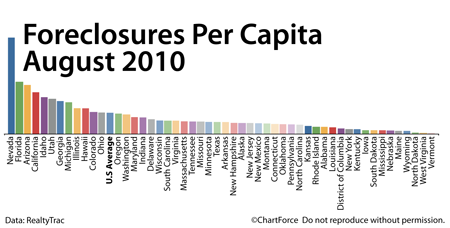 Foreclosures have had a hand in falling home values in Massachusetts and across the country. And, although it’s self-serving for banks to meter the release of homes under ownership, everyday homeowners benefit, too. Fewer homes on the market helps to provide a floor for housing values.